The Mars Assignment, written and directed by (top) Ronan Marra, co-created by Elsa Hiltner, now through Nov. 20, 2016. Today, a young girl presents a school project about astronomy. An ad executive is preparing to pitch a new client. A stand-up comedian prepares for a tour. Everyone is feeling it. But no one wants to talk about it. The touchy subject is depression. Collaboraction Theatre Company, Chicago's social issue-driven contemporary theatre, looks forward to tackling mental illness with The Mars Assignment, a world premiere production about depression and its many stigmas, through November 20, 2016. Written and directed by Ronan Marra, former Co-Artistic Director of Signal Ensemble Theatre, and created in collaboration with noted Chicago theater artist and Collaboraction Company Member Elsa Hiltner, The Mars Assignment will shine a light on the presence of depression in contemporary society and the stigmas that continue to keep our friends and loved ones from seeking treatment for their mental illness. Just last month, JAMA Internal Medicine published survey results that found less than a third of people who said they were depressed had been treated for the symptoms. Drawn from research and interviews, The Mars Assignment puts a human face on a serious and sensitive topic few want to confront, offering an entry point for recognition and conversation about a public health problem experienced by more than 19 million Americans, or nearly 10% of the population. "People with depression are usually placed in exploitative roles in theatre and film - meaning that the characters are often used to create the crisis or arch of the plot through destructive addiction, self-harm, or a suicide attempt," says Hiltner, who was inspired to start the process to create The Mars Assignment. "We specifically set out to create a show that showed realistic characters living with depression in the way that millions of people do. Living the 'everyday' and navigating stigmas, without leaning on the stigmatizing tropes of suicide and addiction." 1579 N. Milwaukee Ave., in Chicago's Wicker Park neighborhood. Performances run through November 20: Thursday through Saturday at 7:30 p.m., Sunday at 3 p.m. Additional Industry Night performances are Monday, November 7 and 14 at 7:30 p.m. Single tickets to regular performances are $20-30; $10-$15 for students, educators and industry. Note: NAMI (National Alliance on Mental Illness) will be participating in post show talkbacks. One more post-show comedy night is scheduled Saturday, November 12. 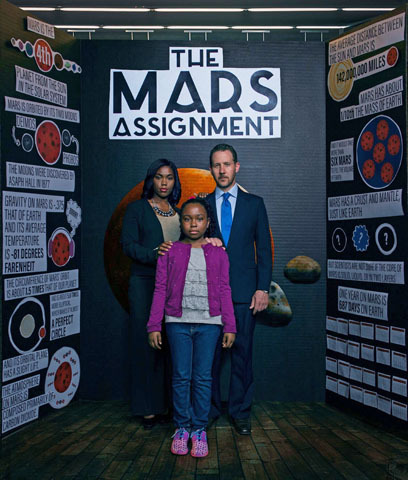 The Mars Assignment stars Georgann Charuhas as Diane, Kristin E. Ellis as Amy, McKenzie Franklin as Alison, Joseph Galizia as Chris, Joe McCauley as Eric, and Justin Wade Wilson as Jeff. The production team includes Ashley Ann Woods (set designer), Maya Michele Fein (lighting designer), Caitlin R. Dalton (costume designer), Anthony P. Ingram (sound designer), Holly McCauley (props designer), Sarah Moeller (producer), Kelly Butler (production manager), Michelle Roth (stage manager), Caitlin Body (assistant stage manager), Becca Venable (technical director) and Domenic Laury (master electrician). Ronan Marra (director/writer) is the founder and Artistic Director of Storefront Theatre of Indianapolis, opening 2017. He was co-founder and Co-Artistic Director of Signal Ensemble Theatre. Directing credits with Signal include The Next Thing, This is War by Hannah Mosovitch, Lascivious Something by Sheila Callaghan, Successors by Jon Steinhagen, Hostage Song by Clay McLeod Chapman and Kyle Jarrow, East of Berlin and The Russian Play by Hannah Moscovitch, Aces by Jon Steinhagen, Aftermath, The Ballad of Sad Café, 1776 (Jeff Award, Best Production, Musical, Jeff Nomination - Best Director), Seascape, Waiting for Godot, Landslide (two Jeff Award nominations), Much Ado About Nothing, Learning to Fly and more. Playwriting credits with Signal include the book for The Next Thing (music and lyrics by Jon Steinhagen), Motion, Aftermath, Landslide (Jeff Nomination- New Work) and Learning to Fly. Marra's plays have been produced or workshopped in Chicago, NYC, LA and Cleveland. He is a 2012 finalist for the Woodward/Newman Drama Award (Motion) and recipient of the 2006 Illinois Arts Council Finalist Award in Scriptworks (Landslide). New City named him one of the "Fifty People Who Really Perform in Chicago" in 2012. Elsa Hiltner (co-creator) is a Chicago based costume designer. She is a Collaboraction company member, an artistic associate of First Folio Theatre, and was a company member of the former Signal Ensemble Theatre. Costume design credits include: Jon, 1001, Yo Solo, El Grito del Bronx, Connected, Forgotten Future, This Is Not a Cure For Cancer, Crime Scene: The Next Chapter, Crime Scene: Let Hope Rise, Crime Scene: The Next Chapter, Peacebook, and many Sketchbooks (Collaboraction); The Next Thing, This is War, Lascivious Something, Successors, Hostage Song, East of Berlin and The Russian Play, Devil's Day Off, The Consultant, Aftermath (Signal Ensemble Theatre);Mosque Alert, Night Over Erzinga, Paulus (Silk Road Rising); Much Ado About Nothing, The Merry Wives of Windsor, Driving Miss Daisy, Twelfth Night (First Folio Theatre); Perfect Mendacity, Twilight: Los Angeles, 1992 (Next Act Theatre): Grounded (American Blues Theater); A Tale of Two Cities (Lifeline Theatre); Bourbon on the Border, The Autumn Garden (Eclipse Theatre); Crow (Walkabout Theater Company);This is Modern Art (Steppenwolf for Young Adults). Hiltner holds a degree in costume design from Western Washington University and has studied costume history in Syria, Jordan, Turkey and Morocco. Collaboraction is the resident theater company in the Flat Iron Arts Building, 1579 N. Milwaukee Ave., at the epicenter of Chicago's Wicker Park and Bucktown neighborhoods. The company's collective three-space venue, Collaboraction Studios, includes The Pentagon, The Vault and The Salon, encompasses 8,000 square feet on the third floor of the historic building, is home to Collaboraction's own productions, as well as a wide variety of visiting Chicago theater and dance companies and comedy groups. Production highlights include Collaboraction's PEACEBOOK Festival in association with the Chicago Park District this past summer, 15 years of the SKETCHBOOK Festival, the company's acclaimed series of Crime Scene productions responding to Chicago's crime epidemic, Sarah Moeller's Forgotten Future: The Education Project in 2014, 2010's Chicago premiere of 1001 by Jason Grote, 2008's world premiere of Jon by George Saunders and directed by Seth Bockley, and 2007's The Intelligent Design of Jenny Chow: an instant message with excitable music by Rolin Jones.